The driver of the Matco Tools/U.S. 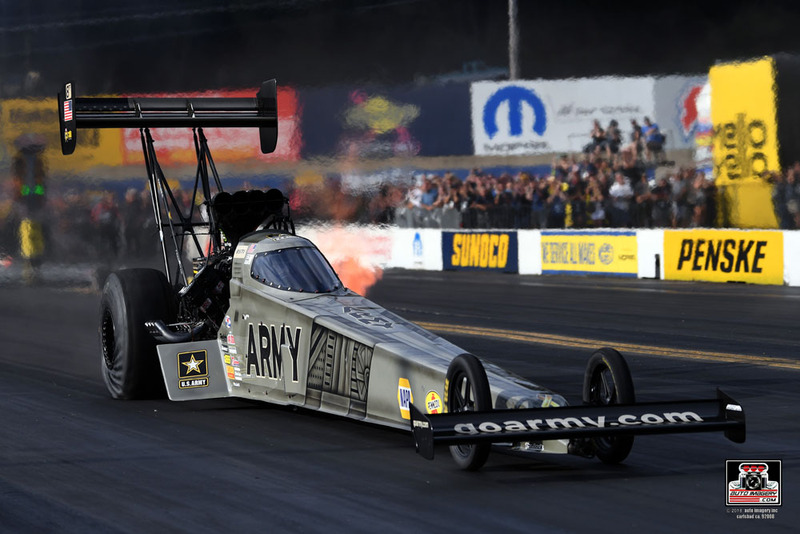 Army Top Fuel dragster began race day from the top half of the field with the advantage of lane choice over opponent Brittany Force. Brown’s 3.800-second pass defeated the reigning world champion’s 4.124 E.T. and pitted him against teammate Leah Pritchett in round two. Against Pritchett, Brown navigated his 11,000-horsepower machine down the track in 3.840 seconds, setting off the win light for the 700th time in his career, while his opponent suffered an explosion in the other lane. The semifinals found Brown facing his other Top Fuel teammate, Tony Schumacher. In the intramural dragster battle, Brown hazed the tires at the 330-foot cone. He gave it a good pedal effort but was unable to chase down Schumacher, and Brown’s attempt to claim his third Maple Grove Raceway event win in four years ended with the semifinals. “This Countdown is rough, but that’s the way it’s supposed to be. It was a tough road today having to race both of my teammates, but you have to beat everybody to win in the Countdown. That’s what our team has always thrived on. "But it’s a great start to the Countdown for us. Any time you can kick off the Countdown in the top four it’s a plus. This race track was really tricky. We just need to get a couple of things leveled out. Now we’re going to keep pushing hard and get ready for St. Louis. If we keep doing what we’re doing, I think we’re going to be in the right spot. We have five races left, so we’re definitely still in it. I’m very excited to get down to Gateway. It’s always been a great race track for us. We’ll come out swinging." Leah Pritchett started race day from the No. 3 seed and opened eliminations against Audrey Worm with a strong 3.786-second at 323.50-mph pass in her Mopar Dodge 1320 “Angry Bee’ Top Fuel dragster, earning the two-time 2018 race winner lane choice over teammate Antron Brown in the quarterfinals. Pritchett’s quick 0.034-second reaction time boosted her “Angry Bee” to the lead off the line, but a loss of traction followed by a fiery engine bang ended her quest for a first career win at Maple Grove Raceway. Pritchett is now ranked fourth in the NHRA playoff chase. "There’s definitely more positives than negatives, and all of that shows in our data. We’re going to have more momentum heading into St. Louis than we did coming here, actually. That creates a lot of confidence for us. A mechanical gremlin caused us to smoke the tires (in round two), and on race day, you pedal and leg it out and try and make it to the finish line first and that didn’t happen second round. But, I’m feeling better as a driver. This team is jelling better and harder than they’ve been in a long time. "We’re just five days away from doing it all over again. Some drivers don’t like swings, I personally love them. Right back into it is exactly where I want to be. These days off unfortunately, we have a lot of work to do. That (explosion during round two) caused a lot of carnage and damage. The Countdown is about to stepping up on the track, and this week we are stepping up off the track to get our parts in place. "This is my third Countdown opportunity and it takes every single thing out of you, to do what we do at this professional level. We’ve been preparing for this all year long and it’s time to see who can stand out during this last sprint of the marathon." 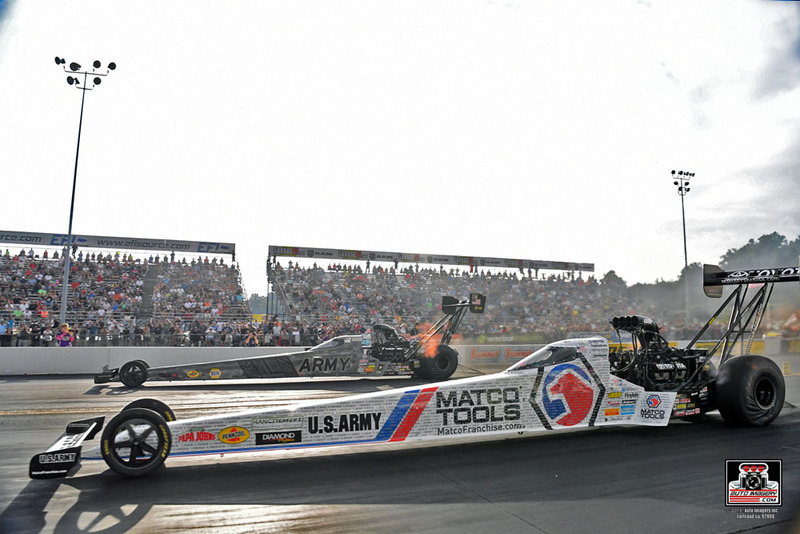 Tony Schumacher advanced to his fifth final round of the season and 152nd of his career, finishing as the runner-up in his U.S. Army Top Fuel dragster during the Dodge NHRA Nationals at Maple Grove Raceway. Schumacher handled Dan Mercier in round one, then knocked out Scott Palmer in a close quarterfinals battle, using a 3.827-second E.T. at 323.19-mph to beat Palmer’s 3.833-second pass to the win stripe. In the semifinals, “The Sarge” left first with a 0.047-second reaction time and battled through dropped cylinders to post a winning 3.939 E.T. against Antron Brown, who smoked the tires early. 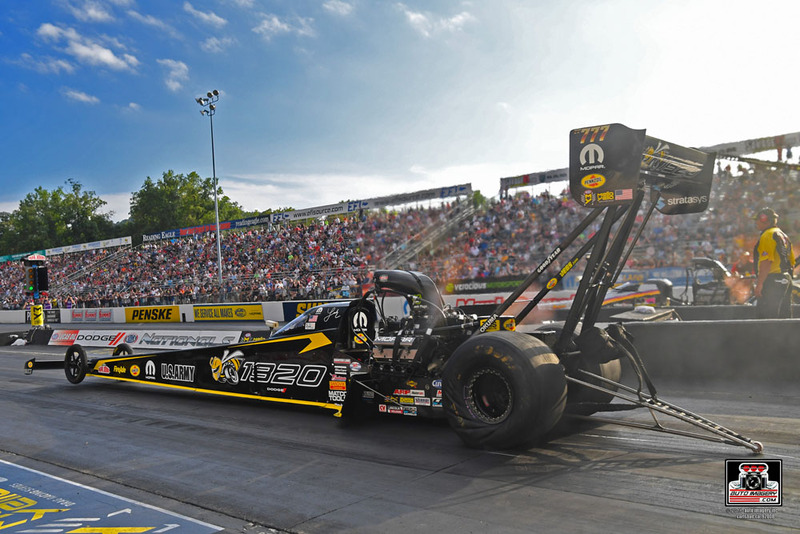 Schumacher’s eighth career final round at Maple Grove Raceway featured a marquee matchup with points leader Steve Torrence, but the eight-time Top Fuel champion lit up the tires early and watched as Torrence pulled away for the event win. Schumacher now has three runner-ups to go along with his five career wins at the Dodge NHRA Nationals, and with his performance, jumped up into a tie for second in the NHRA Countdown to the Championship playoffs. “We got a lot better here this weekend and I’m happy about that. We’ve got a really good U.S. Army car right now. We still have some changes to make, but we are close. We were absolutely terrible in Indy. To come here and qualify No. 2 and then make good runs down the track all weekend is exactly what had to happen. In the final against Torrence, we were very aggressive in our approach. There’s a bump out there that goes across the track. We struggled with that one area, but a lot of cars did. Infinite Hero Foundation Dodge Charger SRT Hellcat Funny Car driver Jack Beckman started race day in the No. 4 spot with the goal of adding to his two career wins at Maple Grove Raceway. Beckman had the edge off the starting line against Cruz Pedregon in round one, but smoked the tires near the 330-foot mark and slowed to a losing 5.135-second at 152.07-mph effort. “Fast” Jack, the 2012 NHRA Funny Car World Champion, leaves Reading in the No. 8 position in the NHRA Countdown to the Championship playoffs. “Sometimes drag racing is would’ve, could’ve and should’ve. We had a great race car with our Dodge Hellcat Charger, and we lost first round. We watched Courtney Force, the No. 1 car in points, smoke the tires and get beat right in front of us, and we didn’t capitalize on that. We came in here in sixth place, and we’re likely going to lose ground. There’s no reason to beat ourselves up about it; these race cars are 11,000-horsepower, slightly unpredictable beasts. 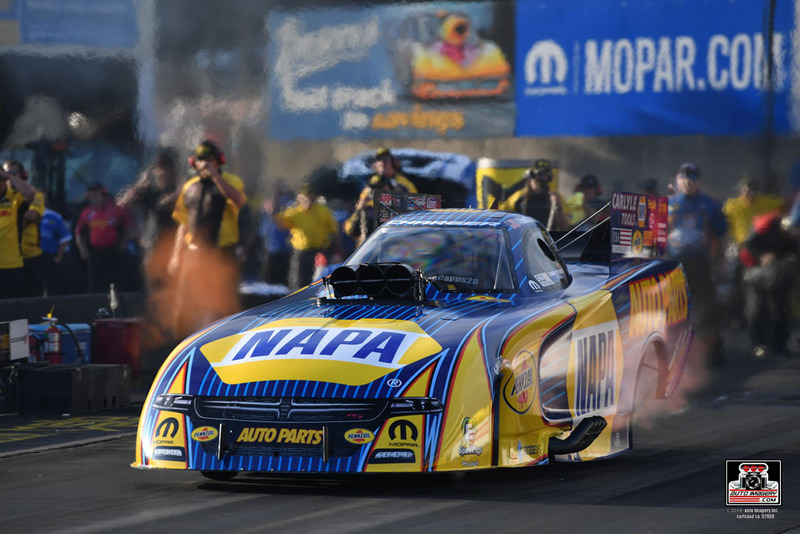 Ron Capps recorded four consistent runs in the three-second range during qualifying to seed his NAPA AUTO PARTS Dodge Charger R/T Funny Car fifth at the Dodge NHRA Nationals. Capps’ consistent performance continued into eliminations with a 3.972-second at 324.26-mph pass to send home Jonnie Lindberg in round one. 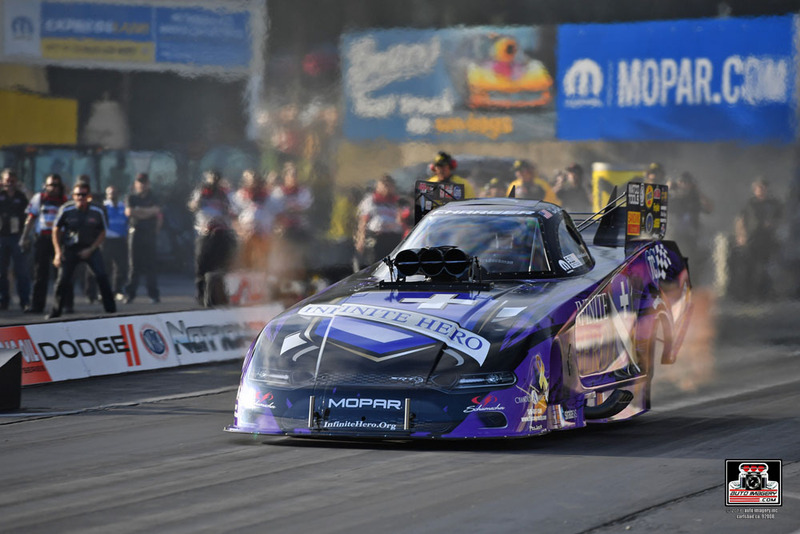 In the quarterfinals, Capps quickly made up a slight starting line deficit to outgun Cruz Pedregon with a 3.972-second run that was second quickest of the round. The defending Dodge NHRA Nationals event winner matched up against J.R. Todd in the semifinals. 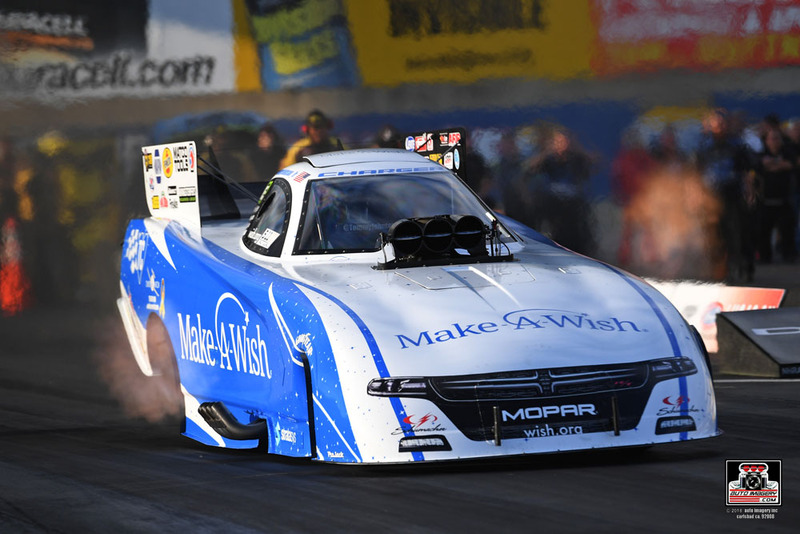 Capps’ string of three-second runs came to an end, and his 4.014 E.T. paired with a solid 0.051-second reaction time fell short of Todd’s winning 3.975-second mark. 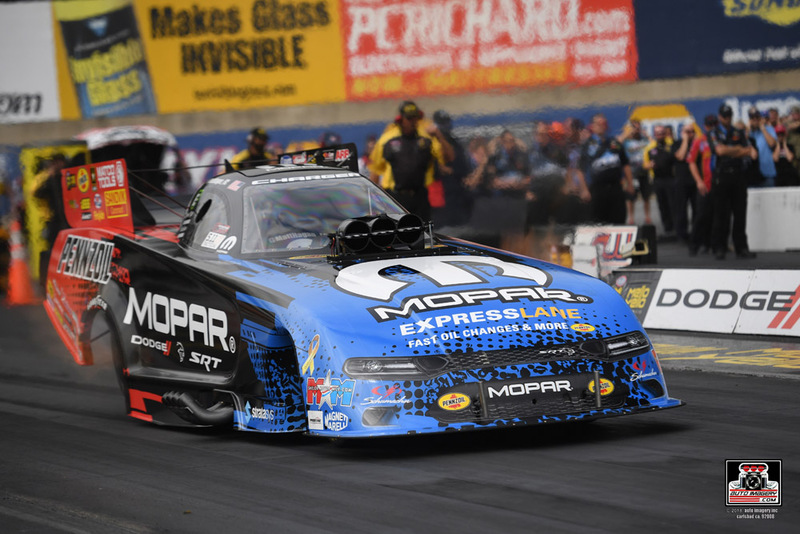 Capps stayed fourth in the NHRA Countdown to the Championship playoff rankings with his semifinal showing, a mere 29 points out of first as he pursues his second career Funny Car championship crown. “We came into Reading as the only car to make three-second passes all throughout qualifying. I shut off a little early in the semifinals when J.R. Todd crossed the finish line and it went 4.01; it may have run another three (second run). But the point is, that’s seven more runs under power without tire smoke or tire shake. That’s the consistency that we like to keep up, and that’s the pressure we like to put on our opponents. Trust me, that’ll get into your head if you’re racing someone that you know is going to go down the race track. "We had such a good race car all weekend and to come up short second round, it’s just frustrating. It was an opportunity to make up some ground in points; we did a little, but it could’ve been a really good day for points. I still think we have a really strong car for the Countdown. We’ll regroup, go to St. Louis and see if we can’t continue the streak we’re on."